The Fratello Marionettes have created a special live-action production of Ravel’s Mother Goose suite just for us! Bring the kids, and enjoy this exceptional family-oriented performance, free for all ages. 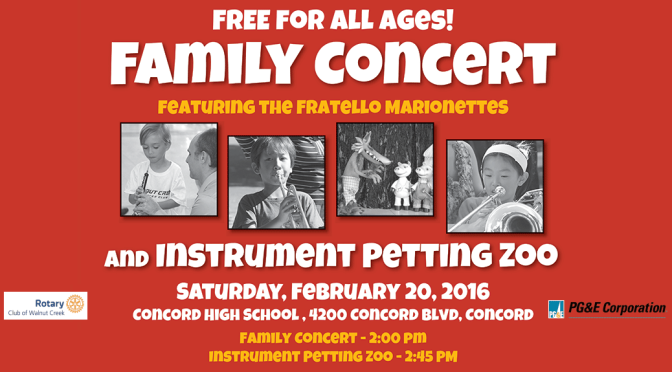 The family concert will be immediately followed by an Instrument Petting Zoo, where family members of all ages are encouraged to come to try out various instruments from the orchestra and see which they like the best! John Williams (1932-) can be considered the father of modern film music with his iconic scores to movies such as Jaws, Jurassic Park, Close Encounters of the Third Kind, Harry Potter, as well as the music for the Star Wars movies. His musical themes bring emotional depth to characters and scenes from other worlds as well as from our own. Before he was quite as well known, Williams composed the score for The Cowboys, a 1972 film staring John Wayne. Wayne plays a rancher who has been deserted by his ranch hands and is forced to use local schoolboys to complete his cattle drive. The Sorcerer’s Apprentice is most widely known as the music that accompanies Mickey Mouse in the 1940 Walt Disney film, Fantasia. It is the most famous and most performed piece by French composer Paul Dukas (1865-1935). Dukas’ composition was inspired by a ballad, Der Zauberlehrling, by Goethe in 1797 which is based on an even earlier tale called, The Lie-Fancier, by the Greek author Lucian (120-220 A.D.). The tale tells the story of a young man learning the art of sorcery. While his master is gone he enchants a broom to perform his job of bearing water to fill a well. After the well is filled he can’t remember the spell to make the broom stop. He chops the broom in half with an ax, but then both pieces continue with the same task, bringing even more water to fill over the top. The sorcerer returns and saves his apprentice, but is not happy with his apprentice’s actions. Ma mere l’Oye, or Mother Goose, is a suite in five movements by French composer Maurice Ravel, based on fairy-tales by 17th century French author, Charles Perrault. It began its orchestral life as a suite of “Five Children’s Pieces for Piano Four Hands” composed from 1908-1910 and premiered in 1910. It was made and dedicated to children and was intended for children to play. In 1911 Ravel orchestrated the suite and later that year expanded the score into a ballet, which premiered in January of 1912.